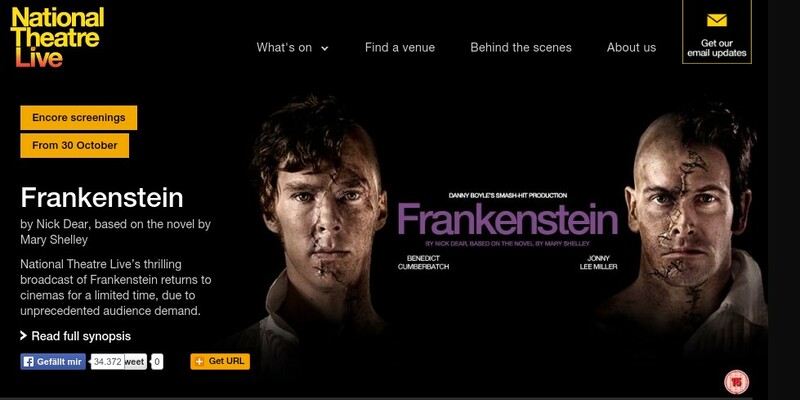 National Theatre Live’s broadcast of „Frankenstein“ is of course a performance I had to watch. As a fan of Benedict Cumberbatch seeing my beloved actor on stage is another step getting me a bit deeper into his brilliant acting abilities. And watching „Frankenstein“ on a big screen in cinema with really good sounds was like sitting on the stage without the need to be dressed up. Or at least very close to it. The story about Victor Frankenstein who creates a human being out of parts of dead bodies is science-fiction but at the same time an age old quest of humanity itself. How do we decide what is human? Do we love or at least respect all men no matter how they look like? The creature (the artificially created human is always referred to as „it“ or „the creature“ or even „the monster“) asks these questions and makes you think about yourself, your reactions and you really care for him (as I like to prefer to see the creature as a fragile human being), no matter how he looks like. Of course there will be people saying that it is inappropriate to bring theatre to cinemas, to bring it to people who normally wouldn’t go to a theatre at all. I think it is inappropriate to decide what is good entertainment and what is bad. The only thing that really counts is if people like it, no matter if they are wearing a gorgeous dress or tee, jeans and chucks. If you want to be entertained and maybe willing to try something totally new for yourself: Go and watch „Frankenstein“. Even a longer travel will make a difference. „Frankenstein“ is a very demanding piece (and it’s therefore no surprise that both main actors are bathed in sweat) only very good actors are able to perform with their parts changing every day in the original on stage. And again Benedict proofs that he is a brilliant actor, who is always very present and breath taking. Both versions are different, not only in the way the main actors are playing their roles. The way the camera presents the play to the cinema audience is also different, so you will see in fact two different performances. Both are worth every minute.